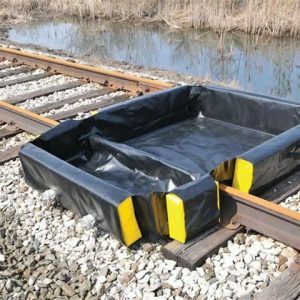 The Quick and Convenient Solution: The Stinger Rail Soft Berm is a hand carried, coated fabric berm with foam walls, which can be easily lifted into place under a rail tanker’s belly header to collect and transport small spills that may occur while coupling and uncoupling for the Header. Two people can easily place the Stinger Rail soft Berm in the center space between the rails, with an out rigger extension extending over the near side rail to form a two compartment catchment surface approximately 4’ wide by 6’long. As the primary catchment berm begins to fill, the captured material flows over the near rail into the outrigger containment berm. In case a larger spill should occur, the outrigger containment berm has been designed with two hose couplings, “CAM-LOC” fittings (2” or 4” dia.). 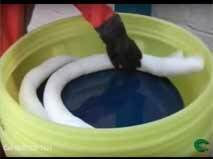 Hose can now be attached to convey the excess spilled material to a safe holding area. Don’t take a chance when coupling up to the belly header, always have a Rail Soft Berm tanker containment system in place.